Ceylon Civil Service, later transformed into Sri Lanka Administrative Service, has been a dignified public service. ‘It functioned as part of the executive administration of the country to various degrees until Ceylon gained self-rule in 1948. Until it was abolished on 1 May 1963 it functioned as the permanent bureaucracy or secretariat of Crown employees that supported the Government of Ceylon’ (Source: Wikipedia). Among the great men who peopled this strikingly distinct public service were Sir Ponnambalam Arunachalam (the first Ceylonese Civil Servant), Shirley Amarasinghe, Raju Coomaraswamy, Sir Richard Aluvihare, M J Perera, G V P Samarasinghe, Bradman Weerakoon, M D D Peiris, Mahi Wickremaratne. Outside the Civil Service per se, there were some outstanding public servants who contributed immensely for enrichment of public life of the nation. Amongst them were Dr Wickrema Weerasooria, Lal Jayawardene and Warnasena Rasaputra. All these gentlemen were not devoid of politics. They certainly would have had their personal political thinking and they even might have had their personal biases right throughout their careers. Yet they did not go before the television cameras and openly canvassed the public opinion on behalf of their masters. That is the legacy, in addition to their splendid work as public servants, which they left behind- a total apolitical demeanor before the public. How does a political bearing of a public servant, especially during the time of an election, do matter and how does that particular behavior color the public service as a whole? That is the question each public servant in the country is faced with today and what Lalith Weeratunga, Mahinda Rajapaksa’s Secretary during the eight years of their power, did during those vile years and what he is portraying himself to be is laughable. Today Lalith Weeratunga is an alleged offender. The allegation that he was one of the key people in the abuse of state money for the purchase the infamous ‘Sil Redi’ in order to sway the voters of Sinhalese Buddhist ilk is a formidable one. How he would be plotting to extricate himself in courts of law is another matter altogether. Yet, Lalith Weeratunga’s assertions that the Rajapaksa Family is the sole political entity that could serve the needs of the people of Sri Lanka are a gross abuse of his office as a senior member Sri Lanka Administrative Service (SLAS). After being a direct beneficiary of the Rajapaksa rule and presiding over a public service that was subjected to total apathy and subservience to one single Family Rule, Weeratunga now resorts to justifying the rule of the Rajapaksas on grounds of speedy action and decision-making processes that were present during that time. After being the most dominant public servant during the Rajapaksa regime, when Weeratunga’s demeanor most undoubtedly reveals a picture of a partner-in-crime, the inevitable message sent down the well-structured layers of the SLAS is one of ‘it’s okay to look the other way when politicians resort to looting the government coffers’. The grave damage that Weeratunga and his cohorts caused to the once-dignified SLAS is incredible. What is even more injurious is what he has chosen to do after his retirement from serving the Rajapaksa family instead of the country. Whatever Weeratunga’s defense his lawyers are contemplating, his association with Mahinda Rajapaksa from the outset of the ‘Helping Hambantota’ fiasco (from which Mahinda Rajapaksa was acquitted by the then Chief Justice Sarath N Silva whose political allegiances continue to change as the country’s un-forecastable weather), has been solid and unbreakable. Nevertheless, Sarath N Silva later apologized to the people of Sri Lanka for rendering a ‘wrong’ decision in the ‘Helping Hambantota’ case. Rajapaksas have a very obscure and indefinable relationship with facts. Having been comforted by the luxuries of absolute power from 2005 to 2014, they are still living in that exalted cocoon from which they seem utterly uncomfortable to come out. This happens to all dictatorial leaders. Chanakya, the sage of the ancient world said that ‘the ultimate goal of all rulers should be to make their subjects free of fear’. The Rajapaksas have done the exact opposite. Having installed his own brother in the Ministry of Defense as its administrative and financial head, Mahinda Rajapaksa unleashed some of the worst and atrocious forces against the people who chose to defy them. Lalith Weeratunga was indeed an integral part of that wheel of fear and terror. A complete public servant like M D D Peiris who was one time Secretary to Prime Minister Sirimavo Bandaranaike would have shuddered and handed his resignation if he were asked to look the other way. Speaking of a public service of the past is utterly useless unless one needs to see where some constructive changes could be introduced and implemented. That public service is gone and is a derelict of the dead past. The current crop of public servants who are dominating the upper echelons of SLAS might not be unrelenting in carrying out the government policies, but their commitment and allegiance to facts, accountability and transparency seems to have fallen by the wayside. If there were one person who could be singularly responsible for such a sharp fall in the public service in Sri Lanka, it is Lalith Weeratunga. His close relationship with Mahinda Rajapaksa made his visibility to the public even more distinct. But what made Lalith Weeratunga utterly guilty of wrongdoing was when he appeared on television and other radio talk shows during the last Presidential Election campaign. They are indeed inexcusable. No public servant has done before and no public servant has done since. Secretary to the President is an apolitical job. He may have his own personal political allegiances and likes. Yet those who are chosen to that service, Sri Lanka Administrative Service, are deemed to have ridden themselves of that political garb when they execute government policies. It is one thing to implement policies and programs dictated by the Cabinet of Ministers who are politicians, but to openly exhibit undiluted bias and prejudices towards a political vision is no embellishment to his professional career. The writer has chosen a quotation by Aung San Suu Kyi, the charismatic new leader of Myanmar. She couldn’t have been more correct. The loss of power for Mahinda Rajapaksa was deeply felt by his immediate family and close cohorts. 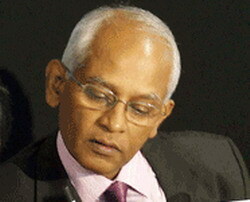 Lalith Weeratunga belongs to the latter category- close cohorts. That loss of power and a faint hope of regaining that power could be all-consuming. There is no aphrodisiac more powerful than power, so said Henry Kissinger. That love of power has turned into a lust; that lust is driving them into a corner, not of reflection on their mistakes and erroneous decisions; it has turned their attention to a more immediate need- how to regain that power. In that pursuit of lust, they are trying to legitimize and validate their wrongful decisions not in the way a scientist trying to rectify an entry of wrong facts into a scientific formula but as a hungry predator pursuing a helpless and unarmed prey running for its life. That is the tragic story of a dignified service to which Lalith Weeratunga belongs. Sinhalese had only seven decades of governing this island out of ten centuries and they had lot of opportunities to flourish economically, socially and culturallly but they always made a bad choice because of their power hungry political and religious leadership. Of course, those political and religious leadership are well off and enjoy the benefits of westernised life inside and outside this island while 90% of the population living in the dark with ignorance with poverty, continued bloodbath, no peace of mind, continued fear, do not know what is going to happen tomorrow to them. Just look around the neighbors, India had wars with China & Pakistan but how many different religious groups are there, how many different languages spoken, how many different races live.They don’t have such a bloodbath in such frequencies as we have in this land. Similar in Pakistan, China, Bangladesh and so on. Look at Malaysia & Singapore how peacefully they live with sound economy. Where is the problem? Think! We lived together peacefully before and during foregin administration but we couldn’t do that after 1948? Why? think! Lalith W in his Daily Mirror interview stated that he does not have a house and using a borrowed old car. Poor Chap- The highest paid civil servant in the country. Also Chairman Telecom Authority, Director Bank of Ceylon ad many other Govt appointments he held due to his support to MR. His wife also held many Govt appointmets including Chairman SEC. Their combined monthly income/ allowance would be over a couple of million Rs a month. LW would have got at least 3 car permits in the 10 yrs. He would have sold the permits and earned a few millions. This man Lalith weerathunga was a pompous personality. He never respected the others but always boasted that much about Rajapkshes. Never ever, he thought that he would end up in a bin as is the case today. Not just silredi, but the collosal sums they wasted for CHOGEM circus was too much. WAS that from their own properties no? Today, the most decent politicians in power, dont abuse the way Ballige putha Rajakshe did. Just this week alone, Mr Sirisena inaaugerates over 150 projects that found its end during last 3 years, but not boasting anything as was the case with Meeharaka Rajakpakshe. MR made it a big issue, and showed up any village school seeking the publicity. The waste he made was bigger than the worth of the toilets and labs got built for village schools. Never ever thought he about the GROUND reality of the poor, just showed off. People have no knowledge to see it right even today, who wasted that much. I HAT OFF TO MR SIRISena and RW. They are just charmant personalites. Lalith W was the one and only senior cicil servant who was a political stooge. The picture in this article- bending so low/worshipping MR tells the story. SHAME to call yourself a senior Civil servant. Apart from SIL REDI case- “Helping Hambantota” it was proved that you as the Secretary to then PM Mahinda, transferred Tsunami funds to the tune of Rs 90 Mn to the private account of MR Sister. A fraud – thanks to CJ Sarath Silva you escaped jail that time. Election time you came on TV to praise MR and asking people to vote for MR. Last election February 2015, Election Commissioner stopperd the broadcast of the program recorded in Kandy”Janapathi Oba Amathai” 2 days before the election. This was aired later by TNL after the election and it was schocking. The program with MR, selected journalists LW and other Ministry Secretaries- Gamini Senarath, SLPA Prabath, and RDA Wijersiri etc. The entire objective was to white wash the corruption charges against MR. LW and others said there was no corruption- “we are the Govt officers responsible for public funds. We have never allowed MR or anyone else to misuse funds”. This interview was such a low level cheap act to whitewash MR corruption, and clearly proved how biased LW was and how he disgraced the entire civil service. Lankens in gerneral dont care about facts and figure, but if neigbhour would start eating cow dug for gaining fotune, they just join to bang wagan. This culture is no fit to the country today – so that is why some hav ebeen thinking that we dont need to vote for any party politcians in next election. And that says everything about the folks. People are highly corrupted. So why not their representatives would NOT behave corrupted. This is the very simple.. yakage haetiyata thamayi wimane goda naegenne. This is the saddest reality. And some men talk high about our people. how can we ever talk hight, that our univeristiie sare far beyong world s best 2000 … not a single uni belong to that 2000. Even Pera is 2300 or or beyond. Like ants see their urine as a big river, we talk higher literacy rates and high about everything Also calling us mid income earning folks, we totally forget over 30 % of poor people, that have not he basics in their life.. meaning shelter and the like. Rajakshes have made people even blind deaf through their proxy media institution. Most of them the media are like parasites… they stand on the way not passing the new further to villagers. All these are just to abuse the poor and let their votes be passed to Rajapakshe extremists. What could a civil servant do against the might of a President? The best he could do was to resign. LW would not have got anywhere by complaining to the Police, as it was politically controlled by politicians, and the IGP was and as always the President’s choice. The Attorney General and the Chief Justice were the President’s choice, appointed so that they would do his biddings, never mind the law. Even in the US CJ is appointed by The President so that these judges see the lay of the case from the President’s viewpoint. All of us live in a dream world thinking that the law was fair, judgments were fair, our lives would become independent if we were out of A’s influence and dictate, but only to fall into B’s influence and dictate. Like so, civil servants in SLK, high or low have not much of a choice; resign from the job and starve, do the bidding of the dictators and at least join him and benefit from his grace. How many Naganadas could we generate out of SLK civil service, or for that matter from this flock of bloggers here, including me. We are just survivors, so was LW. The cohorts of the family have plundered not in small amounts but un mega amounts. Senerath who also worked for the President is charged with having misappropriated Rs 500million. Wickremasuriya former ambassador, Nishantha Sri Lankan CEO, Basil, Gota and all the others are charged with mega amounts of plunder. Wonder how much the leader played out? No wonder the country is broke! Now Rajapakse cries that the country ids broke!!! Aung San Suu Kyi cheated all of us when she read this out ~ “It is not power that corrupts but fear. Fear of losing power corrupts those who wield it and fear of the scourge of power corrupts those who are subject to it.”. The mother of all suckers were the Nobel Peace Committee. The cunning Burmese Junta observed her closely and saw that she was interested only in her privileges. Rest is history. Aung San Suu Kyi is presiding the Myanmar genocide of Rohingyas. The screams of children in unroofed refugee camps in Bangladesh monsoon rains are but music to her ears. To serve his master, Weeratunga, the topmost bureaucrat, went beyond his call of duty. He not only walked but appears to have darted the extra mile. In order to survive, safeguard his position and his realm of influence, he did the inconceivable or unthinkable. Its a known fact that when public servants are appointed to high office (Secretary to President), their responsibility is to act on behalf of all citizens of Lanka and not merely to serve some politician who happens to be temporarily installed in power and that their duty is to promote the interests of the public at large ; not promoting the political fortunes of the political master. Secondly one must understand that even if one does not personally rob or enrich oneself, it is still not sufficient to claim one’s place in the halls of honour and fame if one violates the entire structure of public finance in the country or allows a politician to do so. Whether to take the highway and follow the civil servants’ code of honour or whether to traverse the thoroughfare for reasons of personal survival or gain and bow before a politician’s vile dictates of shame, had dangled captivatingly and alluringly in Weeratunge’s hands Perhaps, in a moment of moral weakness, he had opted to kneel before Mahinda and light the incense sticks to aromatize Mahinda rather than stay faithful to what is spelt out in the Civil Servants’ Bible. Vishwamitra should be congratulated for exposing the dark side of Lalith Weeratunga. The picture says it all. Weeratunga behaved not like a senior public servant but like a domestic servant. He licked the sandals of Mahinda Rajapaksa and his siblings without any sense of shame. Yet he has the gall to claim that he never took orders from Rajapaksa family. What else did he do as Secretary to the President? Maybe he did some mind-reading and did what Mahinda Rajapaksa and his family wanted without waiting for orders! The SLAS has gone to the dogs because of crooked politicians like Mahinda Rajapaksa. The latter did not look for efficient and honest officials. He looked for stooges who will carry out his orders without blinking an eye! The result? The country is going down the precipice! Lalith Weeratunga has another case to answer, bordering on “pimping”. The report on the enquiry on the Sri Lankan airlines stated that a Sri Lankan Airlines girl was transferred by LW to Namal Rajapaksa office and she was paid a huge salary and allowances. LW as the Secretary covering the Airline, signed the transfer paper. Her only job was to be one of the girl friernds of Namal, paid by the state. Lalith W also has another case to answer, bordering on a charge of “pimping”. The Report on the Sri Lankan Airlines enquiry stated that a stewerdess was transferred to Namal Rajapaksa office -to do nothing but being Namal Rajapaksa baby. The transfer was authorised by Lalith W as the Secretary responsible for Sri Lankan airlines and he authorised a fat salary and allowances and a car. Her only job was to please Namal as one of his many girl friends. The first Senior Civil servant to be a pimp! asked for it , one shameful act and My3Ranil gave it double shame response ! your real boss that is the general public ? are all products of politics led by non other than political leaders . consequences are a matter of non stop chest beating celebrations ? dream come true ? There was a war and you didn’t lose nothing ? Haramanis , wake up and be real ! You may be one another who got deceieved by Rajapakshe mantra. They just abused the nation by the name of War victory. You should raise the question yourself.. then if you are a healthysould you, would come to a reality..how the victory was achieved. – if late Mr Kadirgamar was unable to get LTTERS banned on rich soils, could the elemination of terror within the country be ever possible ? There, we know that Not magical powers of Mr Medamulana worked in getting them eleminated in 2009 but the collectivity. Visvamitra does not like the rajapakse? All politicians from 1948 onwards stole most killed so what is new? At least that awful war is over.